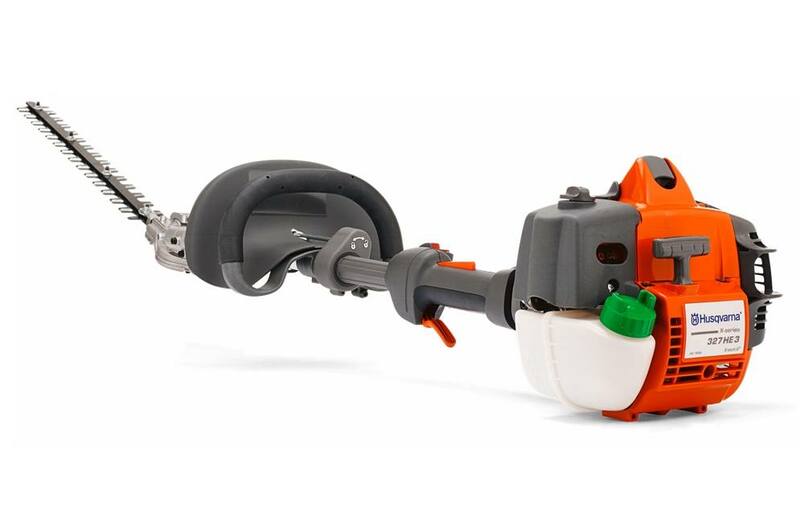 A professional pole hedge trimmer with an articulating cutter bar. Adjustable cutting bar for greater versatility and less stress on the operator. Including the operator, the machine's maximum reach is approximately 10 feet. The operator's position between the engine and cutter-bar makes the machine exceptionally well-balanced and comfortable to use. Fitted with Husqvarna's E-TECH II engine for more power and better fuel economy. Articulating cutter bar: Adjustable cutting bar for greater versatility and less stress on the operator. The cutter bar can be angled in numerous positions to clip overhead and low-lying hedges easily. Knife adjustment range, up/down: 45/85 deg. Recommended maximum twig diameter: 0.79 in.